Georgia Tech Research Institute (GTRI) researchers work closely with the local emergency response community to assist in standard operating procedure development, training, equipment research and development, and on-site assistance. GTRI hazardous materials program is composed of researchers and educators with extensive hazardous materials emergency response backgrounds. This service is available to the area fire community through the Georgia Mutual Aid Group (GMAG) as a specialized HazMat team. The GTRI group provides technical assistance via the telephone, on-site technical assistance or on-site HazMat entries if necessary. In one recent event, GTRI was called upon to assist local emergency responders in identifying the cause of contamination at a medical office outside of Atlanta. The office had been evacuated due to respiratory distress in several office workers. Through telephone assists, the GTRI personnel were able to provide several possible sources of the contamination. The building was eventually reopened. In another recent event, GTRI was called upon to provide recommendations on how to approach an event resulting from the mixture of two chemicals. 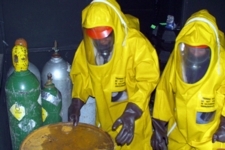 GTRI provided advice on both the level of personal protective equipment and decontamination methods. The GTRI researchers are also actively involved with the GMAG - Georgia Mutual Aid Group - organization. GMAG consists of approximately 50 fire departments in Georgia who are actively working together to promote mutual aid between districts while having operating guidelines that are well established. These guidelines allow different agencies to work together seamlessly for incidents ranging from fires to hazmat to natural disasters. Development of the Decision Aid by GTRI researchers has been instrumental in helping train area agencies in WMD preparedness. In one recent incident, a local county Fire Chief requested the Decision Aid for use by paramedics to try and determine a possible chemical agent identity. The Decision Aid suggested that a nerve agent might be the culprit. This event was an unannounced training exercise between local law enforcement, fire, emergency management and National Guard personnel. The actual identity of the "unknown agent" was a classic nerve agent. Personnel were told after their involvement period in the incident at hand that it was a drill. Through the comments and feedback provided by area first responders, GTRI researchers have been able to make advancements in the Decision Aid device to make it easier to operate and more informative in an emergency response environment. The continued training and assistance to the area first responders provides direct help back to the GTRI research community for system upgrades and future additions. GTRI researchers also need to keep abreast of the current state-of-the-art in analytical instrumentation for emergency response. These studies are passed on to the local responders so that they too are able to be aware of current technologies. When instrument reviews are on-site at GTRI, the demonstrations are opened to various local departments also.